This photograph has been scaled down; full resolution photograph is available here (742 by 519 pixels). MILITARY SECRETS ARE THE MOST FLEETING: The Zero was very maneuverable well armed w/ 2x20mm wing mounted cannons and 2x7.7mm machine guns and had long-range. It did have its weaknesses light construction, no armor protection for the pilot or fuel tanks. FLAME THE ZERO: Allied pilots developed tactics to combat the zero. The firepower from the .50 caliber machine was enough to shoot it down most. WALK THOSE SLUGS IN: US pilots would use deflection shooting aim just ahead of the zero, and the pilot would fly into the fifty caliber slugs. Hitting the pilot, fuel tanks or engine he's gonna go down. Most of the time, the zero would break up in the air from the impact of those fifties. 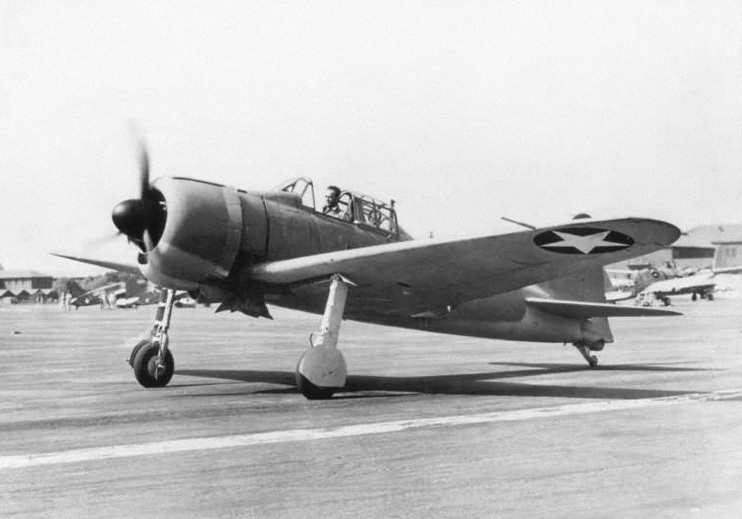 LOST WAR PRIZE: The A6M2 Model 21 in above photo was tested until it met its fate from a US Navy SB2C Helldiver's propeller chewing up the zero's tail. With such a war prize, you would think the navy would have follow me vehicles in front and behind with checkered flags and flashing lights, to warn other aircraft that were about to taxi.